Boat Description Pro Team 165 is an ideal boat package to get started in the sport of fishing. 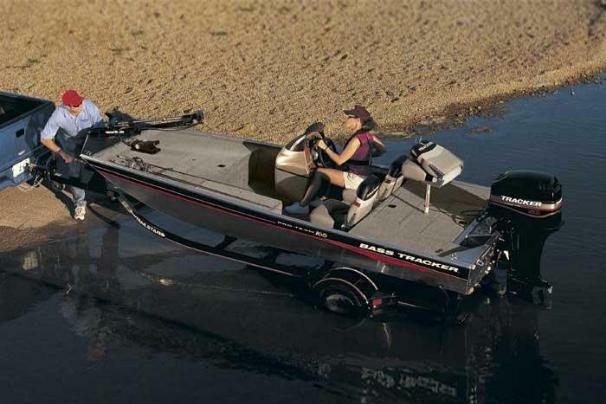 As the most accessible Mod V bass boat in the Pro Team line, it goes anywhere and is a snap to trailer, launch and store. The Pro Team 165 package includes a Mercury Pro Series outboard, Lowrance X37 fish finder, MotorGuide foot-controlled trolling motor, large, aerated divided livewell with timer and rounded corners, lockable seven-foot rod storage, raised casting decks, non-skid bow mat and easy-to-tow custom trailer with EZ lube hubs and GalvaShield protection. With its wide 72` beam, the Pro Team 165 offers a roomy, stable platform for families and friends who love to fish. Dry Weight 768 lb approx.